Kids love camping so why not thrill them with the opportunity camp some place new… in their own backyard. Though it may sound like a crazy idea, families are embracing this simple staycation idea by creating nights at home that the kids will never forget. In addition, giving backyard camping a test drive at home allows the family to determine readiness for the actual wilderness. Plus, the pets can join in on the fun, too. Camping is about instilling an appreciation for nature and the tools to do so await in your own neighborhood with a little creativity. We’ll give you tips for how to plan the perfect camping staycation in your backyard from fun activities to food to where to sleep. Of course, since it’s your own backyard, deciding to sleep outside on a whim is perfectly acceptable. However, surprising the kids with a few tricks up your sleeve will enhance the experience. Decide what the allowable reasons are for re-entering the house–using the bathroom is obviously one, but think as a family about what else is absolutely necessary. Running back and forth to grab this and that detracts from the ambiance. You’ll likely need a checklist to remember everything that you need. Here’s what you need to decide first and foremost–how much technology will you allow? Are we talking about modern camping or the rustic type we loved as kids. Watching iPad movies is a reality of camping these days so decide if you’re going completely old school. Agree to tech rules as a family in advance and stick to them. Let the entire family participate in the experience by contributing to one aspect of the evening ranging from favorite snacks to favorite games. Dust off camping gear from tents to compasses and prepare as you would for a normal camping trip. Have the kids pack favorite toys, pajamas and other necessities as if they’re really going camping including. You do the same. Unless safety is a concern, turn off landscape lighting on order to mimic the great outdoors. Prep meals inside the house before camping begins but make sure it’s in line with the camping theme. There’s no need to go gourmet unless you want to. Simple hot dogs will do and if you’re able to roast them on a hanger over an open flame, that’s all the better. A Weber-style barbecue works but if a modern gas grill is your only option, go for it. No grill? No worries… campers all over the world still indulge in tasty taco in a bag or Frito pie involving an individual sized bag of zesty chips (Doritos, Fritos), ground beef (prepared in advance) and preferred taco fixings. Need inspiration? Sunset Magazine has an entire section dedicated to easy and gourmet camping food. 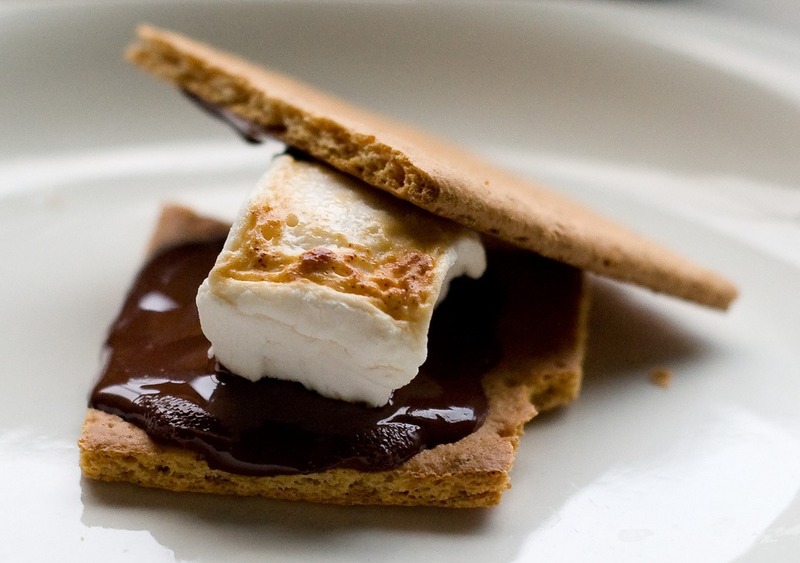 Not only are s’mores trending in luxury hotels across the nation, they’re a campfire staple. Check your local regulations in regard to open flames but s’mores (with a little patience) can even be roasted over simple tea lights, if no fire pit or barbecue is available. Buy a bag full tea lights and light several at a time. Tip: Opt for Reeses Peanut Butter Cups as your s’more chocolate of choice. Grab the binoculars, backpacks, canteens and compasses to explore your neighborhood in a new way. Walk the route yourself prior to identify items for kids to find on a scavenger hunt. Look out for birds or use an app to plot a short route and see if your kids can follow it. Pick up leaves and interesting objects to scrapbook later. Nothing is required other than imagination, your body and some willing participants. Charades is the ultimate camping game. Play soccer or a simple game of catch. Have your kids seen a hackey sack? Dust off your old-school skills. Seemingly a lost art these days, a game of go fish or crazy eights might be the ticket. You are going to care more about where and how to sleep than the kids will so give it a little thought. Have enough comfy lounge chairs to sleep the entire family? Go for it. Want to simply roll out sleeping bags on the lawn? That’s OK, too. The easiest thing to do is pitch a tent that you already have in the backyard. If you don’t have one, a simple pop-up tent will cost less than hauling the family to a campsite, typically. 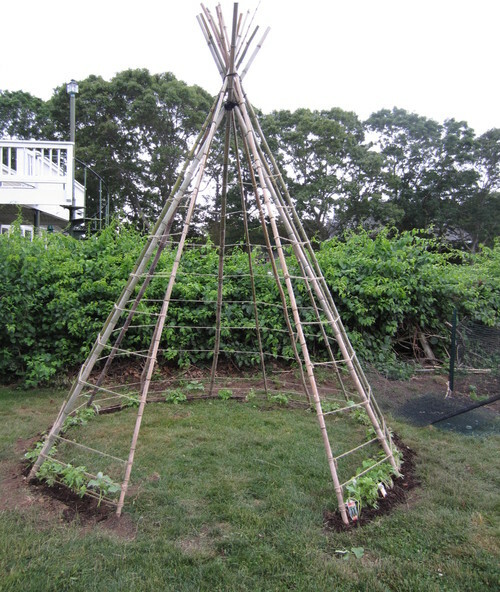 Teepees are in. Pitch one inside the house, in a kid’s playroom or bedroom. Have one or more handy for outdoor use at any time. Search Pinterest to generate seemingly a gazillion designs for this simple abode. 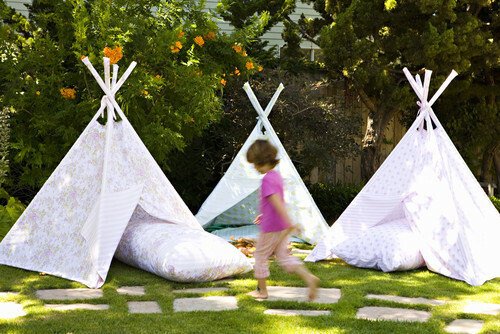 In fact, teepees can even be practical. Even Bob Vila has instructions regarding how to make your own kid’s teepee using bamboo poles, a painter’s drop cloth, string and a few other gadgets. Whatever you decide, have your tent ready to go early in the day to both build excitement and enable you to focus on other staycation camping activities versus struggling with your sleeping quarters. Kids may want to participate in pitching the tent, just as they would at a real campsite. If you lack grass in the backyard, don’t fret. 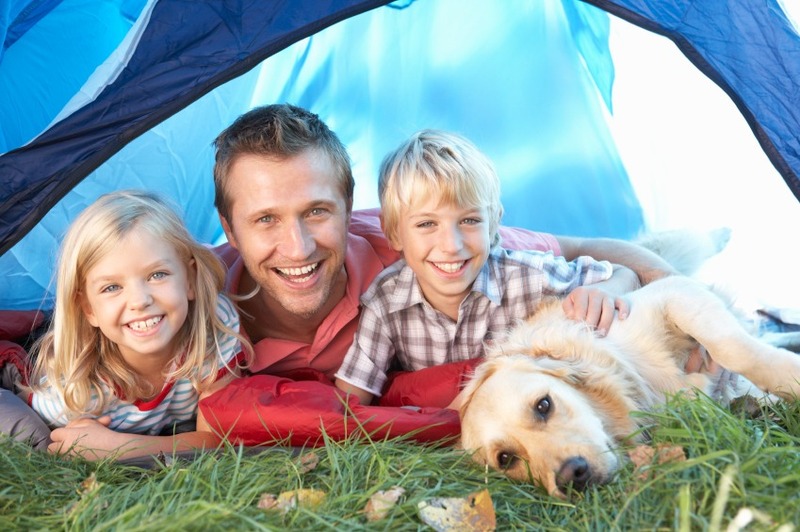 Keep in mind many dome tents just require weight inside—you and your family—to hold them down. There are plenty of ways to stake a tent on a concrete or paver patio. This method applies to artificial turf, too. The easiest method involves tying tent stakes with rope around heavy leftover pavers, concrete blocks or bricks to hold the tent in place. If your stakes have existing anchor loops around them and wind isn’t an issue, simply placing something heavy on top of them may do the trick. Buying or borrowing a good old-fashioned air mattress or air bed won’t break the bank and will definitely soften the blow between your back and a hard surface. This may depend on your neighborhood lights, but if weather permits, give stargazing a go. Do a little research to see which stars and constellations are potentially seen from your house. Look at NASA.gov for inspiration. Huddle up as a family and tell age-appropriate ghost stories. Or, use the rare unplugged moment to chat—bond, if you will. You might be surprised by the number of games you can play with a flashlight. Grab some cheap glow sticks from the dollar bins at Michael’s or similar to create glow-in-the-dark jewelry and a fun path to the house, if need be. Mark the tent stakes or blocks with a glow stick on top so no one trips over them. Even the trendy Rainbow Loom has glow in the dark rubber bands if your kids want to craft by flashlight. 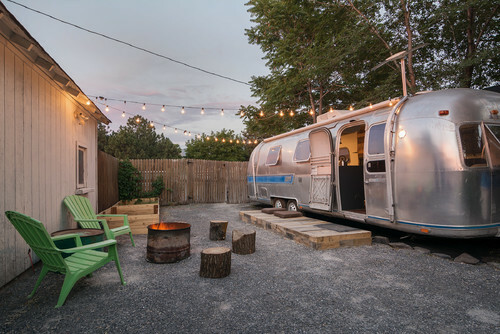 There’s no need to always hit the road in an awesome Airstream. If you’re lucky enough to own or rent one, why not pull it up to the backyard? Have you ever gone backyard camping?